The fourth year of the Lil Faider Interfaith Scholar-in-Residence Program focuses on another major world religion, Buddhism. The study of this Eastern based religion follows our exploration of Sikhism, Native Spirituality, and Islam. Our goal is to learn about the beliefs and practices of Buddhism along with an understanding of its history, culture, and its application to modern living. Sensei Ken Madden was born and raised in beautiful British Columbia where as a kid in the 70’s he rode his bike past the Steveston Temple with some curiosity. He first came to the Calgary Buddhist Temple after encountering Shin Buddhism online, then attended an Introduction to Buddhism class, met Senseis Ikuta and Martin and stayed to make tea a few times. Making tea was a direct path to wanting to know and serve more. He joined the Temple Board in 2007, traveled to Japan with Sensei James Martin in 2009, completed the Jodo Shinshu Correspondence Course in 2010, and undertook the Minister Assistants Program at the Jodo Shinshu Center in Berkeley California in 2010 and 2011. 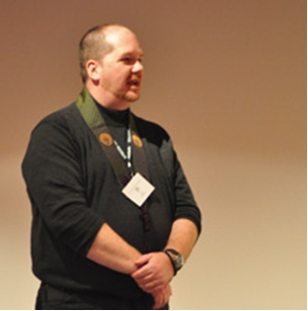 He joined Minister Assistants from the Buddhist Churches of America (BCA) and from across Canada (JSBTC) and Europe in studying and completing Tokudo Ordination in September 2012 at the Head Temple of Nishi Hongwanji-ha in Kyoto Japan. Sensei Ken now assists Sensei James in service, trying to mindfully chant well and still makes tea. Married to Teri and dad to two grown daughters that he is exceptionally proud of, Sensei Ken makes his living in corporate IT. Please click here to read Sensei Ken Madden’s BTZ Shofar articles. Please see our videos from the Buddhism lectures below.